A new 16-storey Condo Residential Hotel will soon rise in F.Cabahug St., Mandaue City. This modern type Residential-Hotel Building is strategically located near Sykes Call Center. It is 5 to 10 minutes drive to SM City and Ayala Business Center and just minutes away from schools, medical centers, shopping malls, golf courses, hotels and much more. A major access road from Cebu to Mandaue and Vice Versa. 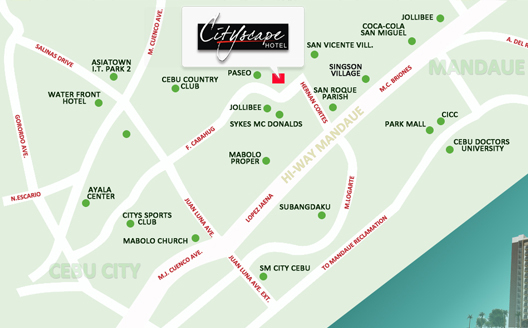 “MYVAN Cityscape Hotel” is the third project of MYVAN Properties and Development Inc.
deserve. Before ending your day¸ make a beeline for the pool and let the warm water drain those tired muscles away. And after¸ take solace at your one or two-bedroom sanctuary where you can capture the nightlights from your big glass windows. A perfect place to make your every day end right.